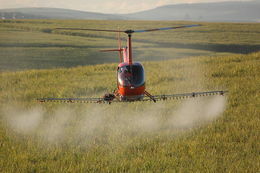 Micronair atomisers for helicopters have been developed from over 30 years’ experience in the design of pesticide application equipment for agricultural aircraft. 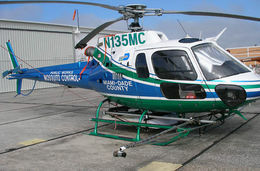 Micronair offer a choice of wind or electrically driven atomisers specifically developed for helicopters. 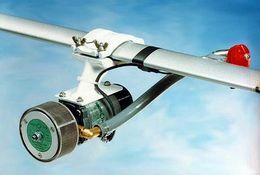 The AU7000 wind-driven atomiser is ideal for operations where the helicopter is flown at a constant and relatively high airspeed. The AU6539 electrically driven atomiser is recommended for operations requiring a low or variable airspeed that would make it difficult to maintain the correct rotational speed with wind-driven atomisers. Mounting clamps are supplied with the atomisers and are available for a wide range of round and streamline section spray booms. In addition to atomisers developed specifically for helicopters, Micronair AU5000 atomisers can be used on helicopters operating at higher airspeeds. See Micronair Product Selection Guide for further details. 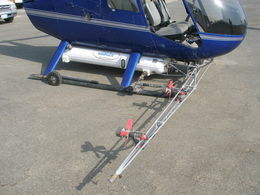 Micronair atomisers are designed for light weight and low drag to minimise their effect on helicopter performance. The AU6539 uses a highly efficient electric motor to give maximum output whilst keeping the electrical power consumption within the sometimes limited capability of small agricutural helicopters. The four fan blades of the AU7000 ensure high efficiency and drag over a wide range of airspeeds. The unique benefits of rotary atomisation ensure that where required a maximum number of low-drift droplets are created. However, where an operator requires application equipment suitable for drift spraying (for example in locust or migrant pest control), the unique flexibility of Micronair atomisers offers operators the ability to create smaller droplets as required. At all rates of application the Micronair helicopter range of atomisers allows the operator to control the droplet size to a very narrow spectrum. The droplet size is varied by adjusting the rotational speed of the atomiser. This is achieved by varying the angle of the fan blades on the AU7000 or by means of an optional electronic speed controller for up to six AU6539 atomisers. In an industry where time is money, the benefits of increased work rates through accurate and effective application can quickly be realised from reduced flying time. Overall flow from the helicopter is regulated by the boom pressure in exactly the same way as a conventional spray system. Every atomiser is supplied with a diaphragm check-valve to ensure immediate shut-off of chemical at the end of each spray run.